Allrounder John Mooney's maiden first-class five-for and an unbeaten half-century from Ed Joyce led Ireland to a strong position on the second day of the ICC Intercontinental Cup final in Dubai. 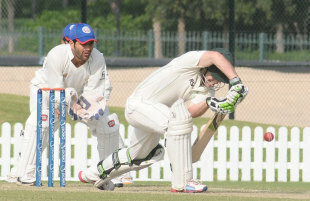 At close of play Ireland were 159 for 2, ahead by 164, after having clinched a five-run lead in the first innings. Mooney, who had dismissed Afghanistan's top order on the first day, got the first breakthrough for Ireland, dismissing Rahmat Shah to break the 57-run stand for the fourth wicket. Afghanistan lost Asghar Stanikzai and Samiullah Shenwari quickly, but a 42-run stand between Mohammad Nabi and Mirwais Ashraf took the side to within 12 runs of Ireland's first-innings score. Trent Johnston, playing his last match for Ireland, brought his side back into the game by dismissing Ashraf for 14. Afghanistan lost their last three wickets with the score on 182, as left-arm spinner George Dockrell wrapped up the tail. Dockrell finished with 3 for 52 and Johnston chipped in with two wickets, to add to Mooney's 5 for 45. Ireland lost opener Paul Stirling early in the second innings and William Porterfield fell after a 38-run stand with Joyce. Niall O'Brien and Joyce then added 106 runs for the third wicket before stumps.